TRAVERSE CITY — Founder Harlan “Pete” Peterson, former owner and chef of the legendary Tapawingo restaurant in Ellsworth, welcomes Chef Candice Lee — and you — to the 2014 Great Lakes ~ Great Chefs dinner. Lee lived in Beijing from 2006–2013, spending five years at Black Sesame Kitchen, a private kitchen and cooking school located in the heart of Beijing’s old district. 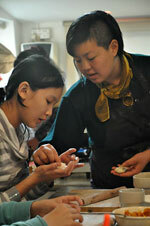 She has pursued her love of food by eating her way through her travels in China. She has appeared on MSNBC and Lonely Planet TV, as well as written for Frommer’s guide books. In addition to amazing food and a spectacular view from Lobdell's Teaching Restaurant, guests at this annual fundraiser will enjoy musical entertainment from the Nomads. The evening begins with cocktails at 6 p.m. and dinner at 6:30 p.m. Tickets are $95 each and available online or by contacting the NMC Foundation at (231) 995-1021.